Our aim is to maintain a high standard for both our food preparation areas as well as the food produced. All dishes prepared in our kitchen are made from only the freshest ingredients and are cooked to order in an open kitchen, so you can see the chefs and exactly where your food is being prepared and the ingredients we are using. For those who want to eat in, we can accommodate up to 12 people with seating at tables or on the bar stools at the window Bar where you can watch the world go by! We offer home deliveries but please call early to book as we can get very busy at peak times. Minimum delivery order is £20 and there is a small delivery charge (£1 for local area of Tang Hall, Heworth, Badger Hill, Burnholme and Stockton Lane, £2 for Dunnington. As we are a real family run business, we close on occasions in school holidays. Please follow us on Facebook to stay informed of any times we may close. 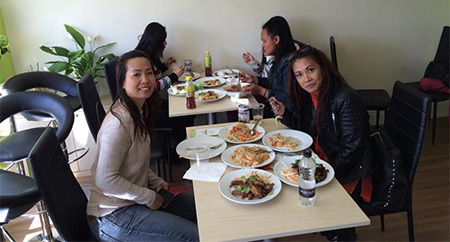 For a true taste of Thailand try Bamboo Thai. You will be assured of a warm welcome and beautiful food and we look forward to meeting you soon. 5 Star food and 5 star Hygiene! 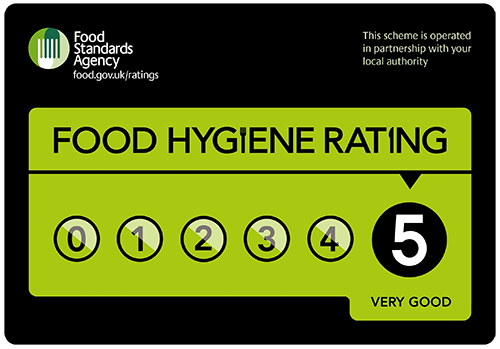 We are pleased to say we have been awarded the highest food standard hygiene rating of 5. All our dishes are prepared individually when ordered. Therefore there may be a short wait for your order to be prepared. Please let us know if you have any special requirements when you order.